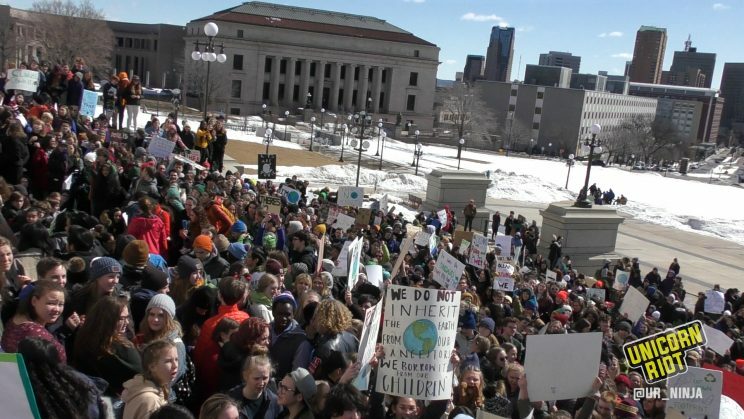 St. Paul, Minnesota – Hundreds of Minnesota students joined a worldwide youth climate strike held on Friday, March 15. The Minnesota rally was one of thousands of rallies led by students and youth from over 128 countries protesting the lack of action on the climate crisis. Hundreds of Minnesota youth pack the capitol steps in St. Paul March, 15, 2019 protesting for action on climate change. The Minnesota contingent of the strike rallied for two hours on the St. Paul capitol steps. The speakers spoke against the current Line 3 tar sands oil pipeline project slated to cross indigenous lands in Minnesota, and raised awareness of climate change’s disproportionate impact on communities of color. “1. We demand a reduction in greenhouse gas emissions in line with the October 2018 IPCC Special Report on Global Warming of 1.5 °C. 2. We demand our world leaders take action that ensures global warming remains under 1.5 degrees. “We need to keep the fossil fuels in the ground, and we need to focus on equity. And if solutions within the system are so impossible to find, maybe we should change the system itself. After the rally we spoke to a few youths in Minnesota and asked them why they joined this worldwide call to action. 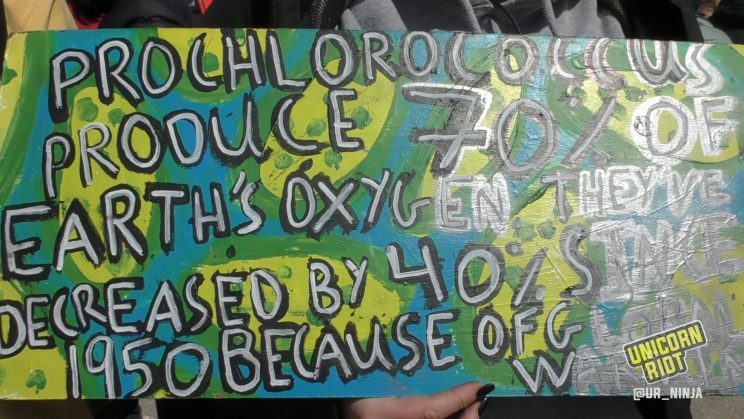 We spoke to another youth who held a sign that warned of the increasing death of micro organisms due to global warming that have decreased oxygen worldwide. A sign with a plea from a microorganism that helps produce the oxygen we breathe, dying because of warming oceans. It’s unsure how governments will respond to the thousands of youth-led actions, but with the recent reports that there are only twelve years left to make needed changes before climate “catastrophe“, it does seem that time is running out.